As part of its ongoing efforts to give back within its community, Vantagepoint Software has made another donation of more than $10,000 to Shriners Hospitals for Children. Vantagepoint AI, (www.vantagepointsoftware.com) is the software company that developed the first artificial intelligence (AI) trading software in the world available to retail investors and traders. Located in the Tampa Bay area for 40 years and still family-owned, the company’s primary goal is to empower traders daily. Vantagepoint also has a philosophy of doing well and doing good. By sharing forward a percentage of its profits, Vantagepoint is helping to create a circle of empowerment within its community. Additionally, many of the traders using Vantagepoint’s software have chosen to contribute to Shriners on their own; one has even identified Shriners as the beneficiary of his trading successes in his will. Since it began its efforts to support children in the Tampa Bay area two years ago, Vantagepoint has been able to donate more than $40,000.00 to Shriners. Vantagepoint has donated over $640,000 to the local community since 2007. “We chose to support Shriners Hospitals for Children because we felt that one of the most crucial times for families not to have to focus on finances is when their child is sick. The fact that Shriners helps families no matter their ability to pay for services resonated with us,” explains Mendelsohn. At a recent Vantagepoint event, Mendelsohn was able to present the latest donation from the Vantagepoint family to Bentley, who won the hearts of everyone at the event. Bentley personifies why Shriners’ role in the community is so important. Along with Bentley, his mom, Linda, and Lisa Buie, from the Shriners organization, were on hand to accept the donation of $10,127 from Vantagepoint. “I’m grateful to have a successful business here in Tampa and proud that my team works so hard that we can continue to support Shriners. It’s a joy to give a portion of our profits to a group that is doing such meaningful work. I am humbled and thrilled that some of our traders have chosen to follow our lead by giving on their own too — no family should have to worry about finances when their child needs life-changing help,” adds Mendelsohn. 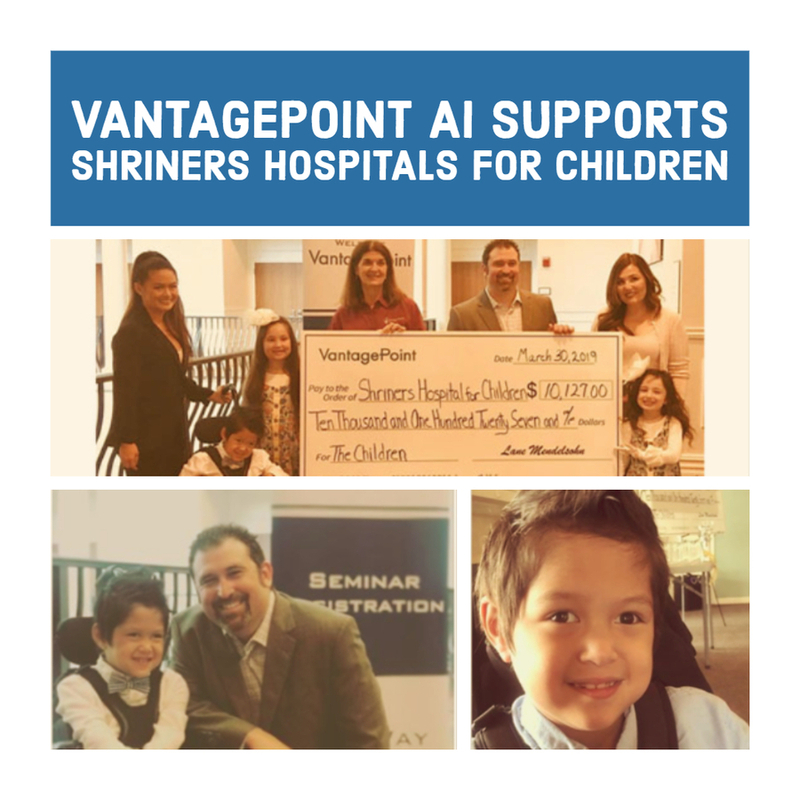 To find out more about how you help support Shriners Hospitals for Children when you become part of the Vantagepoint AI family of traders, and to see the software in action with a free lesson at www.vantagepointsoftware.com/demo or by calling 1-800-732-5407. You too can do well and do good! About Vantagepoint AI, LLC. Headquartered in Wesley Chapel, Fla., Vantagepoint AI, creators of Vantagepoint Software, is a leader in trading software research and software development. Vantagepoint forecasts Stocks, Futures, Forex, and ETFs with proven accuracy of up to 86%. Using artificial intelligence, Vantagepoint’s patented Neural Network processes predict changes in market trend direction up to three days in advance, enabling traders to get in and out of trades at optimal times with confidence. Vantagepoint software was recently recognized as the Most Trusted Online Trading Software Solution as well as one of the Top 10 Places to Work in Tampa Bay. Vantagepoint also employs a family of over 60 team members and is actively committed to giving back in the Tampa Bay community and to Shriners Hospitals for Children.